Are we making significant headway on youth homelessness in Canada? Are we stopping young people from becoming homeless? Are we ensuring that young people transition out of homelessness quickly, and that they do not become homeless again? It is time that we started taking a good, hard look at these questions. In our efforts to end homelessness, we have primarily focused on providing emergency services and supports to young people while they are homeless. Unfortunately, this hasn’t gotten us the results we want. Youth homelessness in Canada is an ongoing problem for which we seem to be making slow but insufficient progress. It is time to consider a new approach – the prevention of youth homelessness. What would have prevented your homelessness? What programs, policies, services, and supports are needed to prevent youth homelessness? What do you want to tell the Canadian government about preventing youth homelessness? How do you want to be involved in making change on this issue? The purpose of this report is to amplify the voices, insights, and wisdom of these young people in order to drive policy and practice change. In our efforts to end homelessness, we have primarily focused on providing emergency services and supports to young people while they are homeless. While this is important and generally well-meaning, we need to question whether this is enough; whether waiting for young people to become homeless before we help them is both sufficient and the right thing to do. In considering how we might reform our response to youth homelessness, young people with lived experience of homelessness need to have their voices heard. Their valuable insights drawn from their experiences can challenge our current thinking and point to a new approach that more effectively helps young people before they end up on the streets. 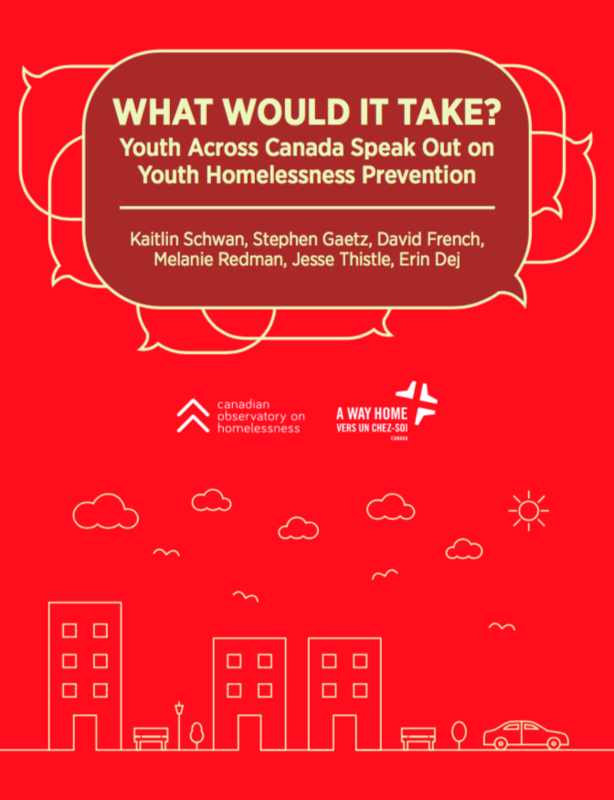 Read the report for youth insights on how we can prevent youth homelessness in Canada.